Belfast-based Wireless Mystery Theatre will be presenting a re-enactment of the infamous 1938 Orson Welles radio broadcast of War of the Worlds, in conjunction with Science NI. The performance takes place at 8pm on the 20th March in the Crescent Arts Centre and will be followed by a short talk from Dr. John Kremer (QUB Psychology department) on fear and communication in the mass media. Wireless Mystery Theatre transports the audience into an old-time radio studio to be AWED! and AMAZED! by faithful recreations of old-time radio suspense plays, complete with sound effects, live music, and ads from the period. This one-off re-enactment of the controversial 1938 Orson Welles version of War of the Worlds brings the audience into the CBS radio studio for the fateful Mercury Theatre Hallowe’en broadcast, a radio play that made headlines all over the world and turned Orson Welles into a household name. Wireless Mystery Theatre will also be debuting Sorry, Wrong Number and The Thing in the Window, two classic suspense plays, with commercial break, in Auntie Annie’s bar on the 21st and 22nd March at 8pm. Tickets are available on the door at £6 or £4 for the elderly and the unwaged: email wirelessmysterytheatre@gmail.com to pre-book. Selected, by the Belfast Telegraph, and Nuala McKeever, as one of the top picks in Belfast’s first Fringe Festival last October and set to perform a run of 20 mystery/suspense plays in 10 days at the Edinburgh Fringe 2011, Wireless Mystery Theatre’s past productions include a re-enactment of the Mercury Theatre (Orson Welles) version of The 39 Steps. In December 2010, WMT entered into the spirit of the season with the Mercury Theatre 1940 broadcast of A Christmas Carol. 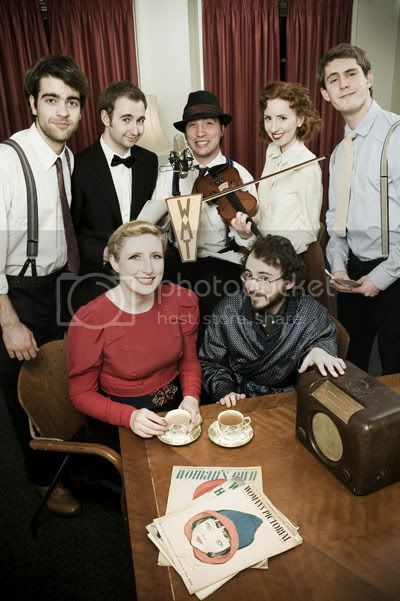 Wireless Mystery Theatre has made appearances on BBC Arts Extra and The Gerry Kelly Show. If I were nearer I would be there. Sounds great.